14th February, Valentine’s day. Here I am sitting at the Starbucks coffee shop waiting for a friend. We planned to go out for dinner tonight. By the looks of it, it does not seem to be happening. All restaurants seem to be completely sold out to the romantically inclined! So, I guess, we would have to do with the coffee alone today. Coming back to the main topic – Coffee shops. I have always liked whiling away time in a coffee shop. As far as I remember, this fixation with coffee shops started with that unaffordable espresso shot at barista on MG road in Bangalore. This was way back in 2005, when I was in third year engineering. That barista has now become a CCD, and my tastes have changed from espresso shots to a hot chocolate (yes!). It has been a long on going journey since that espresso shot at the barista. Right from the “4 seasons” cafe in Vizag for the inexpensive cup of black coffee after CAT classes, to the present day Starbucks, every cup has for sure been totally worth every penny. Coffee shops are so energetic and full of life, and at the same time calm and inspiring. No wonder many bestsellers have been written in coffee shops. Whenever I am in a new city, I always make it a point to spend some time in a coffee shop. Just looking, and if possible, eavesdropping, at people and their conversations is a complete course in human psychology. You get to know the talk of the town? What is the current favorite? Which movie you should be watching the coming weekend! One week later.. 21st February..
Am again at this Starbucks, and it seems that it is just where I left. It is as if time has frozen in this part of the world, inside this hideous place and everyone is still having fun. Of course, the people have changed (but I don’t remember their faces! ), and the talks have changed. But the energy still remains the same. The same infectious energy. See, this is the joy of going to a coffee shop. It feels like returning back to a familiar place. 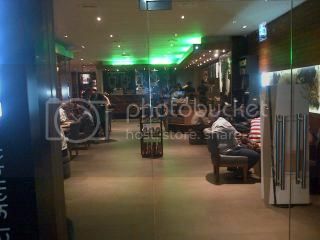 It is not without design that most Starbucks outlets across the world are designed in the same fashion. Or CCD, or Barista, or at other coffee chain. They intend to give you the same familiar look and feel to bring back the warm memories and freeze time for the couple of hours you are here. I can keep singing hours and hours about this wonderful modern day creation, and am sure I would in many more posts. Am off now to get my hot chocolate, and to spend some time eavesdropping.. Er! solitude. See you soon at the next cafe.